Supreme Air provides Air Conditioning, Heating and Plumbing Services, Repair, Installation, Maintenance, and Tune Up in Potomac, MD and surrounding areas. Youssef was very thorough and pleasant! Thank you for taking the time to write this review. We're thrilled Youssef provided you such great service. He always does such a thorough job, ensuring he provides our customers with the best care before leaving their home. We're looking forward to providing you many more years of this same great service. Have a supreme day! Chris arrived on time and proceeded to get acquainted with the heating unit in our Carriage House. He did an excellent job! He found the problem and reset it! Thank you for taking the time to leave a review. We're very pleased Chris was able to provide you with terrific service. Have a supreme day! Very devoted to do great work! Chris was great. He was realistic and talked about how best to approach the problems we have. Pump down refrigerant . Repair leak on lineset and pressurize system with nitrogen and make sure it holds . Put system into a vacuum and make sure it holds . Then charge system with R410A and check operations . Suction pressure 125 , head pressure 290 . Return temp 67.8 , supply temp 46 . Suction line temp 54 degrees . System is operating properly now . Spring Pm on 04/03/19 On arrival set units to call for cooling measured supply and return air temp measured voltage and amps inspected electrical connections checked drain and cleaned checked filters and replaced checked EWP and LWP recommended UV lights installation units tested units operating normal at this time. Also customer has problems with his water heater keep tripping he was reset Avery day or every other day and he have another problem with 2nd water heater the expansion tank leaking water the pipe rust I gave quote for customer he needs talk to Alex first about the price and he will decide. Spring pm on 03/25/19 On arrival set units to call for cooling measured supply and return air temp measured voltage and amps inspected electrical connections checked drain and cleaned checked filters and replaced checked water pressure also checked outdoor condenser unit checked electrical connections checked voltage and amps checked coil cleaned recommended UV Lights installation units tested units operating normal at this time. Spring pm on 03/14/19 On arrival set unit to call for cooling measured supply and return air temp measured voltage and amps inspected electrical connections checked drain and cleaned checked filter recommended air filter need to be replaced also the duct has a l lot of dust duct needs to be cleaned and UV lights installation gave quote for customer needs some time to decide unit tested unit operating normal at this time. Install Intellistart Module. The aquastat controller had the heating set point at 68 degrees. The unit was cycling but turning off once the water reached 68 degrees. Iâ€™m not sure how the controller was reset but I set the heating set point to 110. The unit began heating up. I checked the refrigerant pressures, pressure drop and heat of extraction and run capacitor, all were within specification. I recommended adding Intellistart Module given the units age and tonnage. 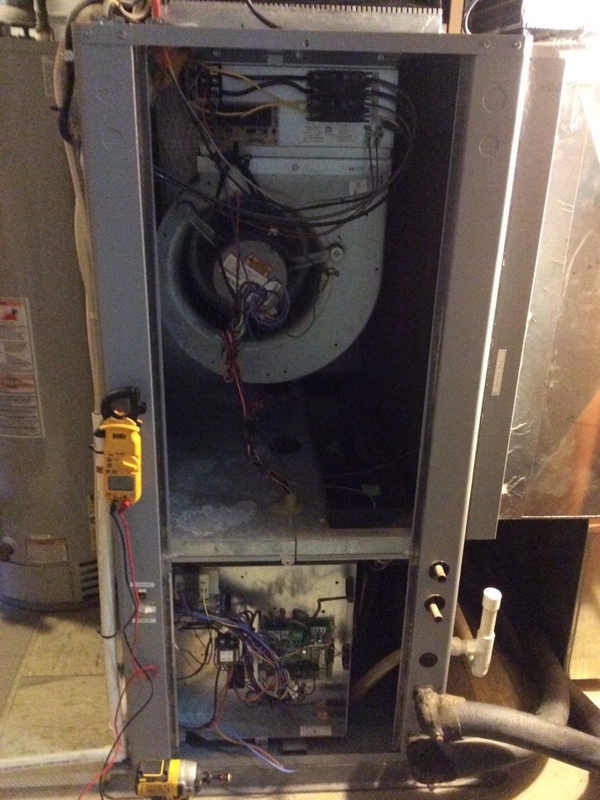 I installed a large retrofit Intellistart Module made by Water Furnace into the unit and restored power. After having the power cycled for controls and the unit the aquastat retained the set point of 110. I used a billing code for small electrical repairs for finding this problem. I used Intellistart installation code for the other invoice item. Unit is operating normal. Wire pump relay. The pump for unit #3 was not coming on. If one of the other units was running then enough water was moving through the unit for it to operate, which is what happened when I charged it. I wired 24 volts to the pump relay and tested the unit. Unit operating normal. Customer to call the office to discuss service membership. I know we talked about it before but for whatever reason getting the units up and running was priority. I replaced the heating txv. Leak checked the system, flushed it out and pulled into a deep vacuum. I charged the system until I had normal operating pressures and normal temperature rise at the air handler. Unit is operating normal. Repair has been paid in full. I replaced the reversing valve which had been disassembled by a previous serviceman. I pressure tested the system and went to test it and found the txv for heating is not opening and the system pulls into low pressure despite having adequate charge. The txv was most likely the original problem but there was no way for me to know. Customer paid 477 toward replacing the txv. Unit #2 has a refrigerant leak somewhere in the system. I feel that itâ€™s in the cube portion but nitrogen will need to be added to be sure of its exact location and that there is only one leak. I did not want to spoil the charge tonight because it is heating somewhat. Itâ€™s r22 refrigerant so once the leak is identified and fixed of its in a place that can be fixed, replacement r22 will be added to specification. Customer paid $600 tonight. On arrival found system locked on fp1 ,reset system ,checked system pressures refrigerant and water .i then increased water flow to 70 % minimum and 100 max on both system .also spoke to tech support and we found that system is operating normal at this time . Performed preventative maintenance on both hybrid systems. For gas furnaces, I cleaned flame sensors, measured ohms of igniters, measured rating of run capacitors, inspected heat exchangers. Ran furnaces and checked amperage of blower and inducer motor, measured heat rise. Furnaces operating normal. For Geothermal units, measured ratings of compressor capacitors, checked contactors, flushed out drains, and checked cleanliness of blowers and coils. Ran geothermal units. Measured amp draw of compressors, blowers, and loop pumps. Measured delta loop pressures and temps as well as delta air temps. Ran humidifier and checked operation. Turned Humidistat on and set to 45%. Units are operating normal at this time. Fall pm on11/21/18 On arrival set unit to call for heat measured supply and return air temp measured voltage and amps inspected electrical connections checked drain and cleaned checked filter recommended to install UV lights unit operating normal at this time. 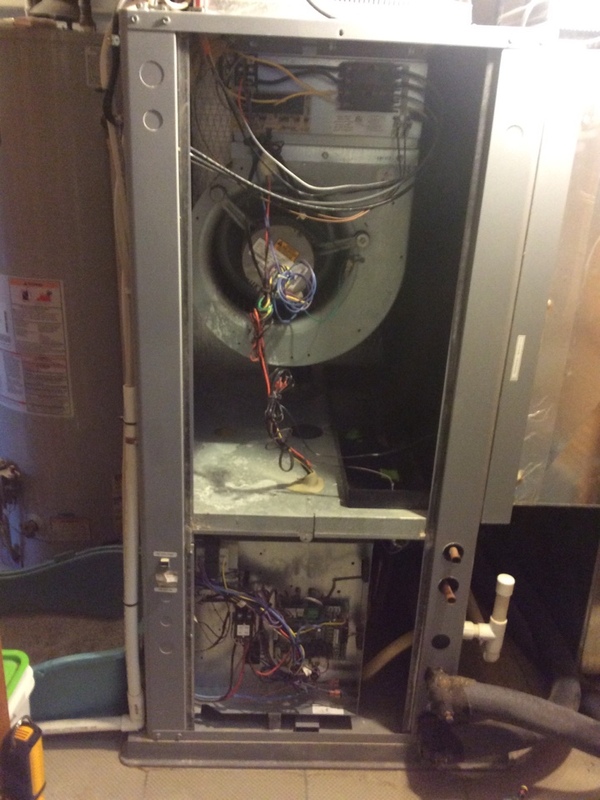 Working on Furnace Maintenance in Potomac, MD.